I was going to say “geek girl” but given how fast technology is changing, I probably have to hang up my real geek hat. But I can still be a gadget girl. Whether it is unusual devices that I pack for travel or an iPad full of apps that I use, technology is generally my friend. One of the last things I do when getting ready to travel is get my travel apps all set up. I often get asked about the travel apps that I use. So here is the current list of major ones. I will start by confessing that I am a devotee of the Apple ecosystem. My best friend Rob has slowly nudged me over to this dark side with Apple gifts. Once I got hooked on instant syncing between devices, I was never going back. I am slowly converting David. This helps us to stay in synch. So all of these are IOS apps. Not sure if they are on other platforms. We do pretty much all of our travel planning online. We use the internet for research and booking. My blog reader (Feedly) is loaded with great bloggers that I follow and regular travel chats add to this. While we still use sites like TripAdvisor to get travel input, more and more I am looking for blogger input. I have tried many ways to keep track of all the information we collect as we plan. 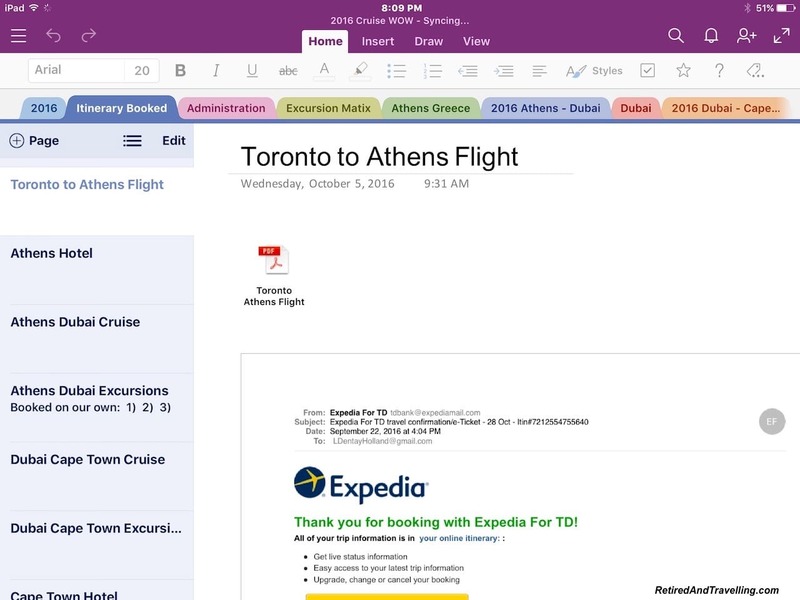 Our current favourite travel apps is MS OneNote. The notebook tab and page visual metaphor makes it easy to organize everything about a trip. The major challenge is that David and I think so totally different about how to organize data. Typically we end up owning certain tabs. We have recently started to try TripIt. I don’t like apps that charge a monthly fee so we are still on the free version. It is simple to mail a copy of your itinerary item (e.g. a flight confirmation) and have it extracted by TripIt into a daily view. This is my quick check place if I need a quick itinerary item. We use it for major portions of our travel – flights, hotels, other transportation and cruise itineraries. If the app does not automatically extract data from an email, it is easy to manually enter information. With the latest enhancements to Apple Notes, it is now part of my regular toolkit. It is often the place for short term information storage or for ensuring I have easy access to information on all of my Apple devices. I always ensure I have airline travel apps before I leave home. While these might be used for reservations and check-in, more and more these apps provide the in-flight entertainment. 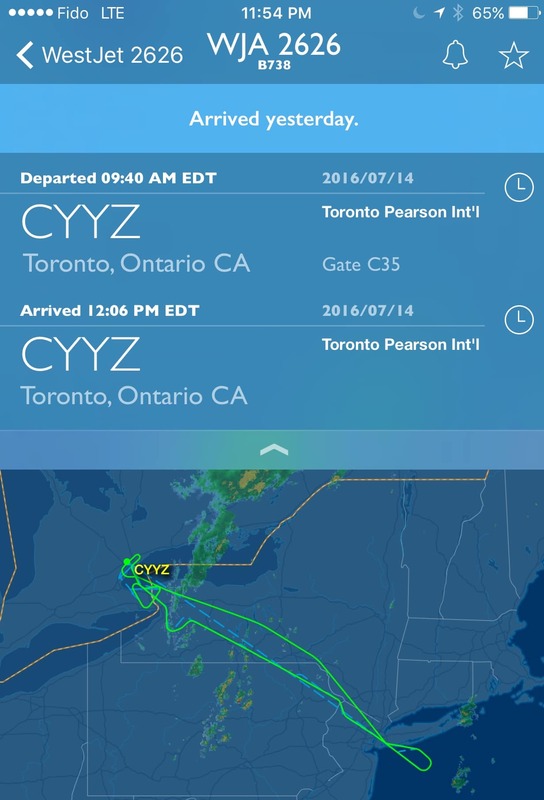 We have been caught more than once without the needed airline app. This has meant using my cell phone as a hotspot to download an airline app while on the airplane and seated. The one flying app that is now part of my travel kit is FlightAware. 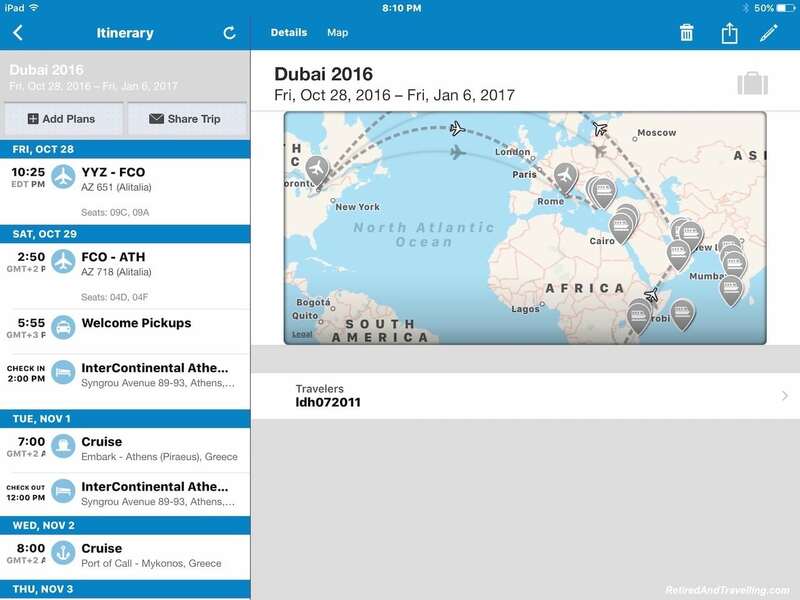 It will generally provide the most up-to-date information on the status of your flight. Often the airlines are loath to or slow to admit flight delays. But the computer knows all. Had we checked on our flight’s status on a recent return trip from St Lucia, we might have saved wasted hours at the airport. We have the hotel travel apps for all the hotel chains where we are loyalty members. This helps us with both reservations and keeping track of our points. We have a few of the general hotel booking sites to help with researching options before booking. 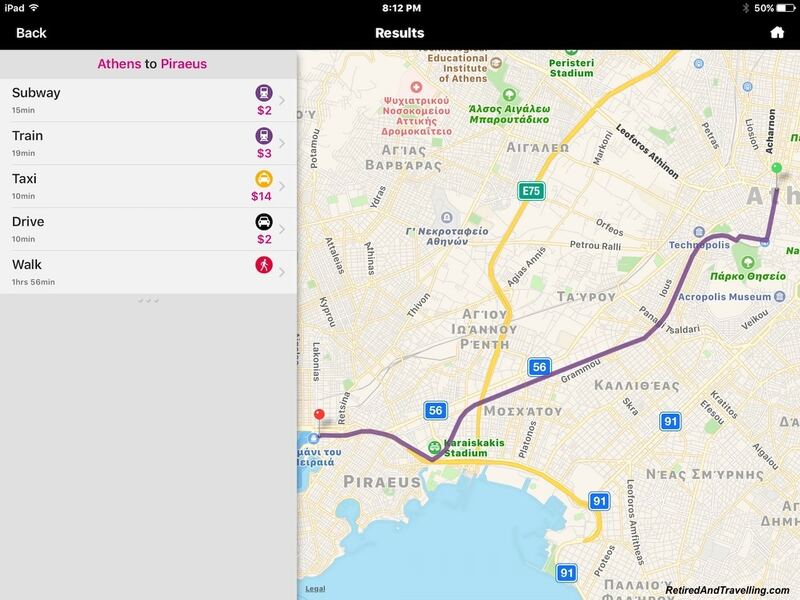 Probably the most useful of our travel apps is CityMapsToGo. This app provides offline maps that update through the wide array of wifi signals in our world. We have found the maps to be highly accurate. I have navigated in small towns in Italy using the app when the handheld GPS was lost. We download the maps for all major places for a coming trip while we are still at home. 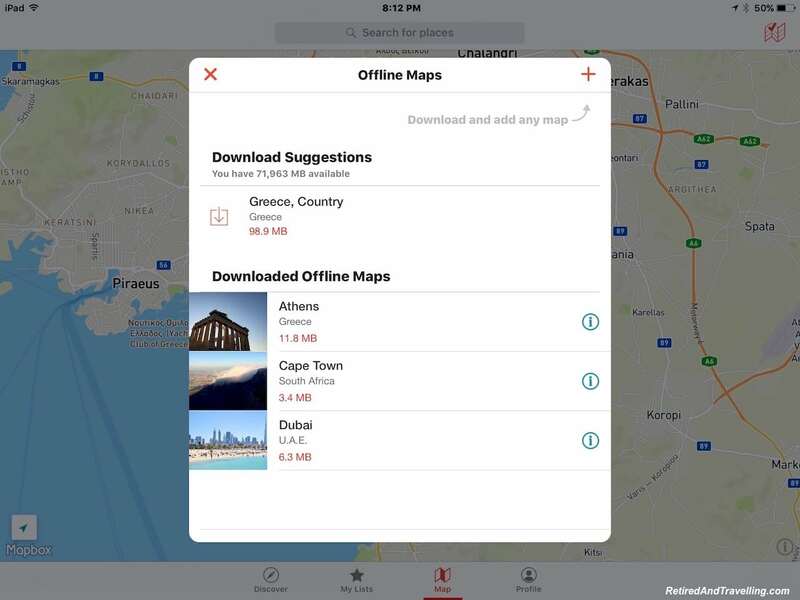 We can add maps when we have a good wifi connection. But once the maps and accompanying guides are on your phones, you are good to roam. To get from place to place, we usually start with Rome2Rio. This was a great addition to our travel apps. The app gives you all the transportation options between two spots. It helps when we don’t know how to get between spots or if we are undecided on the mode of transportation. Having options has also helped us to consider things we might not normally choose (e.g. a bus to visit the country of San Marino deep inside of Italy). We use the WeatherNetwork app to get local weather. My devices are set for weather roaming, so I will get the local weather first. In advance of the trip I will add in all the major locations we will visit. Despite being raised in Canada, I still only speak high school level French. David did French immersion training so he is much better. We have wanted to learn other languages, but that is not going so well. I have played around with most of the major language learning apps and still have not found one that totally works for me. The one that I use the most is Duolingo. I am sure that if I did the lessons as often as I set in my planning guide, my success rate would be higher. 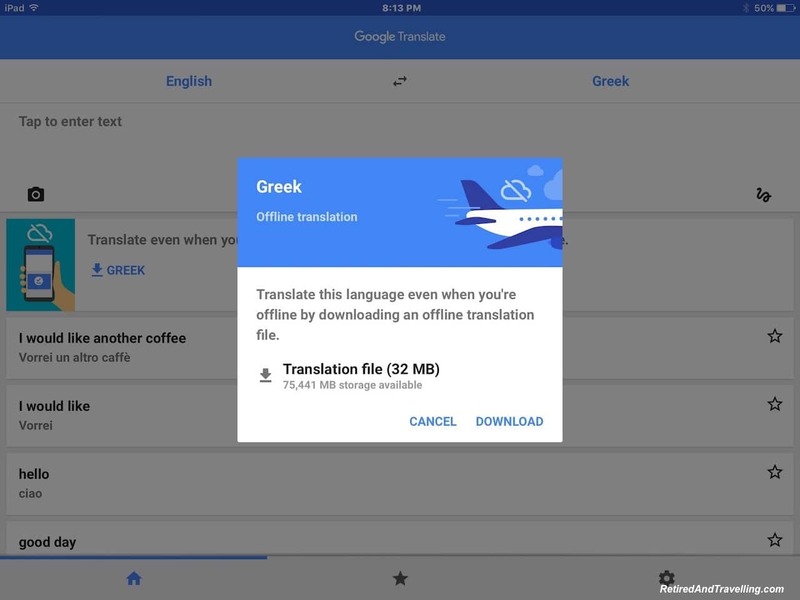 Google Translate is one of the travel apps most people say they use for translating in the moment. It is a quite powerful tool for translating both what you are seeing and what you want to say. Offline capability has been added which may make the difference on how useful this will be. While we often travel connected, I can’t always be sure I will have a data connection. For basic phases, we usually look for single purpose phrase book travel apps for the language(s) of our travels. Before we travel we make sure to update our contact list for mailing addresses, phone numbers and emails. Yes, we may actually mail a post card occasionally. Our regular contacts have different preferences for how they want to stay in touch. Some want email, some are Apple friendly and iMessage works, some need an SMS message capability and others want Facebook messages. My fallback for everyone is email! Of course, no blogger leaves home without staying connected to social media. When I am away I try to update my Twitter, Instagram and Facebook sites regularly. If time zones are a challenge, I use Buffer to schedule updates in local time zones. I am wearing a Garmin VivoSmart HR fitness tracker these days. It keeps me motivate to move, which is usually not an issue when we are travelling. 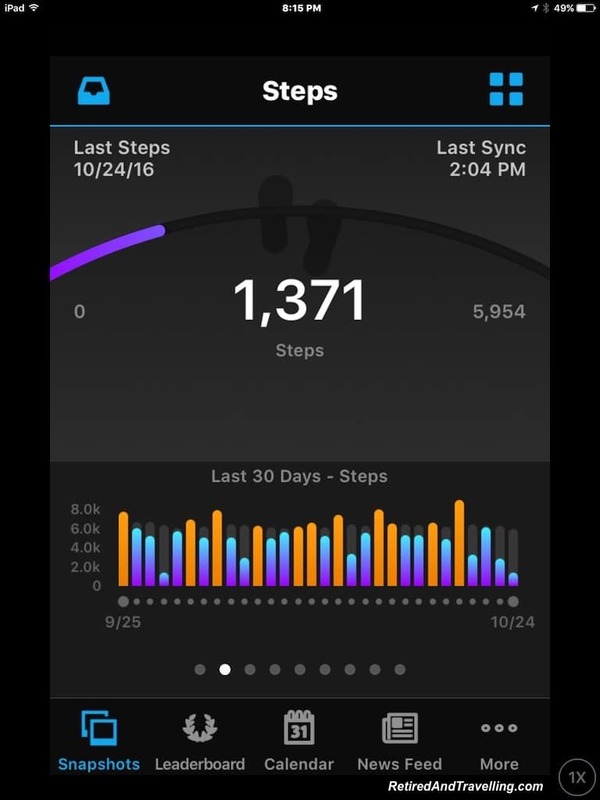 The Garmin Connect app synchs the data from my watch for a much broader display of information and trends. Despite having a photographic memory, I am at that age where writing things down is needed. Every security article I have ever read, frowns on writing down your passwords. I have so many it would need a book! Having KeyChain on my Apple devices helps with website logins. But I often need much more information than just the login information. I use eWallet as my trusted source of all password information. eWallet lets me have different wallets, so I can keep David’s key information in a separate spot. You can create different sections inside the wallet that you can organize however you want. Needless to say, my wallet looks very different from Davids! One of the useful apps on my Apple devices is FindMyPhone. While you can use this if you misplace a device, its real value comes in when a device is gone. When I was robbed in Madrid, the first thing I did once I knew my purse was gone was to use FindMyPhone to shut down my stolen iPhone. My iPad is loaded with entertainment. Too many times we have found ourselves travelling with no in-flight entertainment systems. There have been long delays in travel or long stretches of dreary landscape out the window. While I may want to be productive and work on a blog or pictures, often I just want to relax. My music is always current on my iDevices. Before we leave home I load video or podcasts. I always make sure to have many books to read and I can always get new books online from my library. 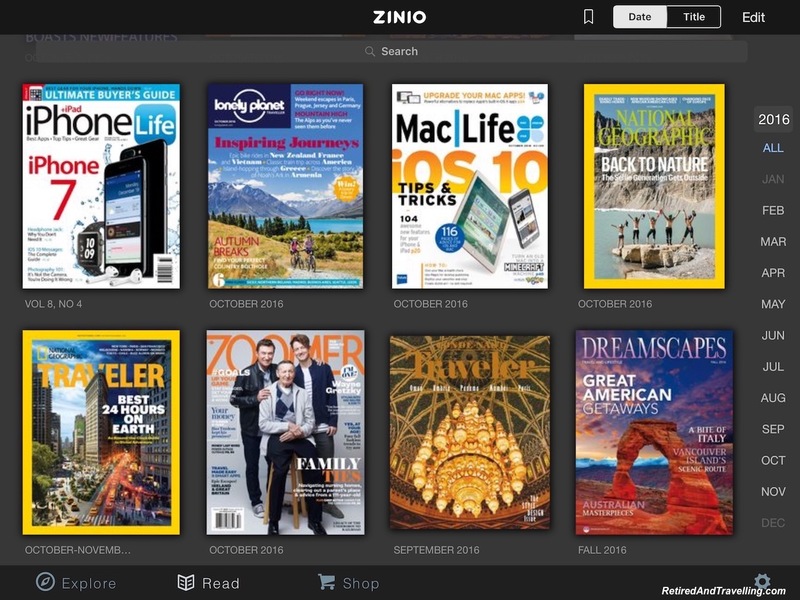 The Toronto Library supports Zinio magazine downloads, so I always have an eclectic set of magazines to read. There are some games on my iPad if I just want to zone out. I do regularly try to pare down the apps on my iPhone and iPad but there are many I don’t use when travelling. Wifi is often unsecured so I rarely use banking or online shopping apps while travelling. 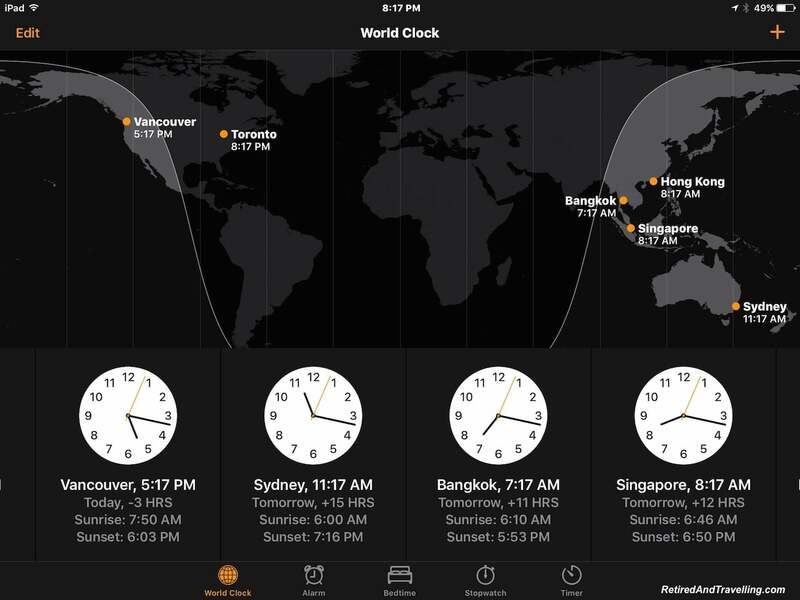 The International Clock app is always a handy tool, even when we are at home. With 3 children each living in a different time zone, this app lets me easily know when it is best to try to get in touch. When we are many time zones away, it is essential if we ever hope for real time communication. Having the local time on at least one device helps us when we first land or have to do a tight connection. When we travelled to Australia and SE Asia, looking at the local time made me realize that I had messed up our arrival day! 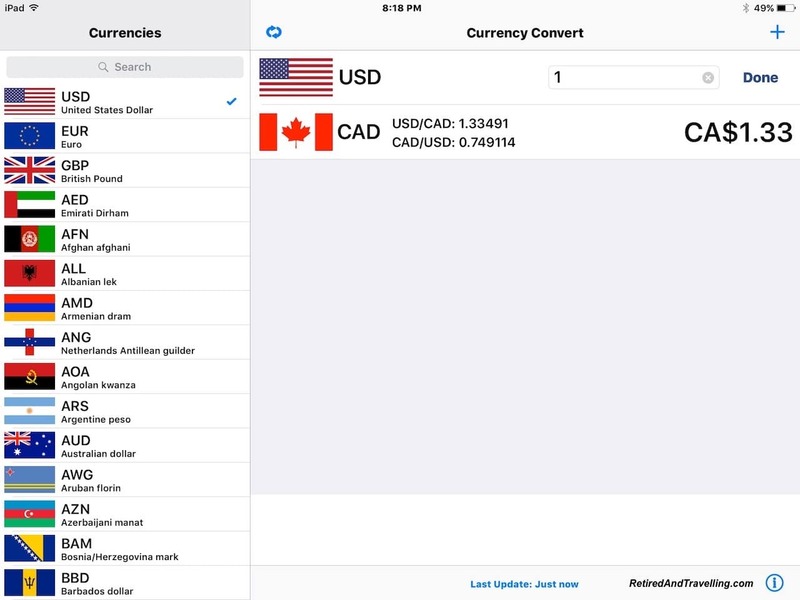 The Currency Converter helps me to see how bad our Canadian dollar is when compared to most other currencies. To David’s disgust I need a Temperature Converter app for weather stated in ºF. Canada went metric in 1977. I can do length and weight measures in both Imperial and Metric. But I have totally converted to temperatures in ℃. I know the math to convert but the app makes it easier. The last app I use regularly is WhiteNoise. I am not a great sleeper and need some kind of white noise that simulates the fan I sleep with at home. If the air conditioning noise is loud enough I am ok. But if it is too quiet, I need some app help. Until I started this blog, I did not realize how much I have moved to the app world. I still use a web browser to for some things (e.g. to translate or convert temperatures). But if I have dedicated travel apps, that is what I will normally use. Single purpose apps make some things easy. And before you ask, we travel with little or no paper. We have some legal papers (e.g. Power of Attorney) with us in case of emergency. We sometimes print key travel confirmations. And my dive log book is only on paper. But for the rest, the gadget girl has found a good electronic option. 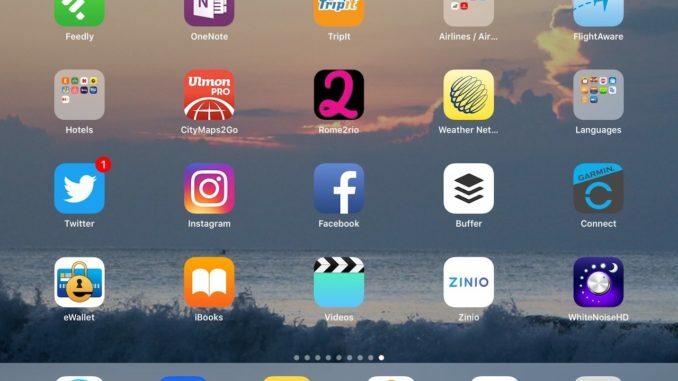 What travel apps do you use? Is there a major one that you think I am missing? What travel apps have you tried and discarded?